The Summer Limited Edition Collection brings beautiful light and color to your natural light images! Create your own signature style with soft and sunny summer colors, rich jewel tones, and luscious black & white conversions. 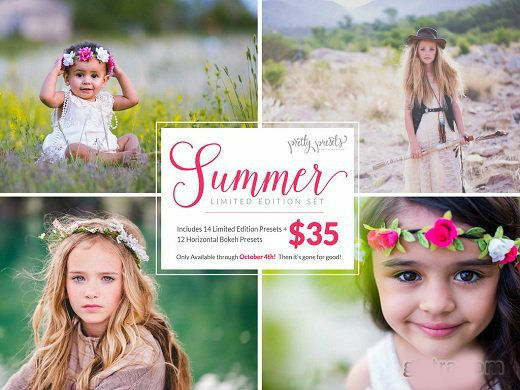 This collection is perfect for any style of natural light portrait photography. You can use these presets in Lightroom 5, Lightroom 6 and the Creative Cloud. This collection can be used on both RAW and JPEG images, too!